Okaaaay, I am taking a slight detour from the family room dilemma to share with you a fabulous new shop that I was lucky to find out about. My good friend, Lindsey, invited a few of us to a jewelry trunk show yesterday afternoon and it offered some of the best antique jewelry I have ever seen. It was the first jewelry trunk show in our area and hopefully not the last. I felt like a little kid in a candy store and I'm pretty sure I wasn't the only one feeling the same way. Mirrored Tray for $25. It would've been at least double the price somewhere else. 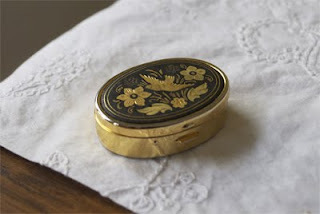 Spanish Pill Box for $12! 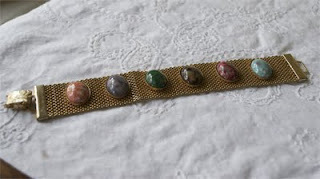 A beautiful bracelet that I can wear with anything since the stones are all different colors - only $18. 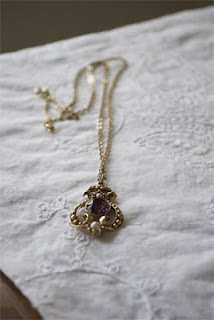 A great pendant necklace for $15. 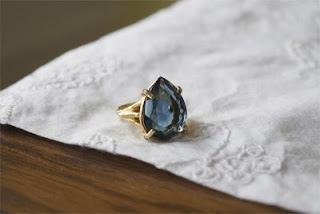 And the pièce de résistance is this beautiful pear-shaped blue stone ring for, get this, only $12!!! 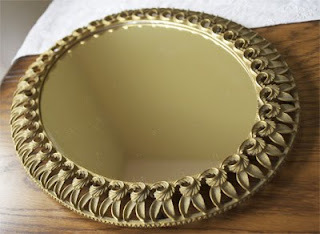 I know, I know the only thing I purchased that has anything to do with home furnishings is the mirrored tray but if you take a look at the Village Antiques and Collectibles website they offer dressers, mirrors, chairs, tables, armoires ... all sorts of amazing things! I could probably spend hours in this shop. So much to look at! Umm, I'll take EVERYTHING here please. As you can see, this shop is packed with all sorts of goodies so go check out their website and if you're ever in New Jersey, please go see for yourself. The shop also offers a great Wish List service. Just let them know what you are looking for and they will do their best to find it for you. Such a cute post! I LOVE Village Antiques, and the shop really does have all sorts of wonderful goodies! Lovely shop, I will go and find out if they ship overseas.